Number of books given away: 100 total, which includes both Smart Agents’ My Books and Keller Williams’ books (no longer available). Biggest benefit of using the books: What I find is that the book really helps differentiate me, particularly, with first-time home buyers, where they don't feel as comfortable as they might be if they already bought a house or two. They're very appreciative, and I know I've made at least a couple of sales that I feel were directly related to the book. Mark is part of a big team, so most of the marketing is team-wide rather than for his individual business. The team does direct mail, events, and anything else they can think of. However, Mark does do some boosting on Facebook. He also pointed out that direct mail is becoming more effective than email because people get overwhelmed and just delete emails without reading to clear out their too-full inboxes. Mark gives most of his books away during open houses, though he says he’s found that open houses aren’t nearly as good at generating prospects as they used to be. Mark finds that when he gets out a book, it helps override this issue, especially with first-time homebuyers. "You know, it's like everything else. You're looking to be top of mind. If they'd seen five Realtors that day, it's just a blur. So, 'That's the guy that gave us the book' — it's just a different kind of take on things for them." "I think it's like most things in life — it's all about establishing rapport and trying to build a relationship. In open houses, it's a function of really being on and up and trying to listen as best as you can. Particularly, if it's a busy open house, sometimes, it's hard to do if you've got three couples swirling around you at the time. But really working hard to pick up on what their specific needs and wants are. I think the more you can share in the way of information, the more appreciative they'll be and the more they'll perceive you as a person that's going to provide them with experience and expertise." Here’s how Mark gets his listings. #1. Mark’s office does a lot of team-wide marketing. He boosts on Facebook. He also uses his MyBooks to make a great impression on buyers who are in the market for an agent. #2. Mark works hard to establish relationships, really listen to what potential clients want and need, and offers them as much information as he can. This allows clients to feel comfortable, feel they're being heard, and know they’re working with someone who has the skills and knowledge to help them. Listen to the Interview Audios below for more details on exactly how Mark does it. Smart Agents: First of all, thank you so much for taking the time to talk with me. Mark: I'm happy to help. Smart Agents: Good. How long have you been a Realtor? Mark: I'm been a Realtor for six years. Smart Agents: Okay. Do you have any types of properties you specialize in? Mark: I'm sort of a hybrid. I do about half my business with investors and half with traditional residential buyers, and I do a little bit with commercial. Smart Agents: Okay. How long have you been using our books? Mark: Prior to that, I was actually buying a Keller Williams book, but I was much happier with the content of your book, so I switched. Smart Agents: Great. That's great to hear. Mark: But the concept is one that I've been using for a couple of years. Smart Agents: Okay. Do you know how many books you've given away? Mark: I'd say ... Well, ironically, Keller Williams discontinued their book, so I ended up buying used ones on Amazon. So, probably, adds up to about 100 total. Smart Agents: Okay. So, including theirs and ours? Mark: Theirs and yours, yeah. Smart Agents: Okay, great. Do you know how many listings you've gotten using books? Mark: You know, I primarily use them for buyers. Listings, it's a different kind of marketing approach for us. Smart Agents: Okay. What kind of buyers do you give them to? Mark: Well, here's the thing. I feel, and this is just my personal opinion, I feel like the market has really changed, since I came into the business. When I first started, you could do an open house, and if you got 10 couples to come through, the majority of them wouldn't have agents, wouldn't be particularly knowledgeable about how to go about buying a house, and were open to the possibility of coming and looking at houses with you. I feel like that, that's evolved over time, and that open houses are a much less effective way for me to generate viable prospects. 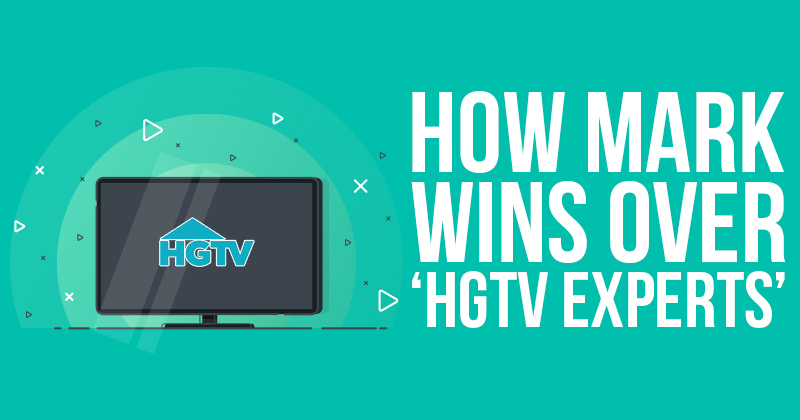 Most people come in now, either have just come from three other open houses, with three other agents who have hit on them to represent them, and they feel like they're knowledgeable between the internet and HGTV. They feel like they have an awful lot of expertise, and it's just much more difficult to get folks to commit to working with you, particularly, on the spot. What I find is that the book really helps differentiate me, particularly, with first-time home buyers, where they don't feel as comfortable as they might be if they already bought a house or two. They're very appreciative, and I know I've made, at least, a couple of sales that, I feel, were directly related to the book. It's just, you get ... You know, it's like everything else, you're looking to be top of mind. If they'd seen five Realtors that day, it's just a blur. So, “That's the guy that gave us the book,” it's just a different kind of take on things for them. Smart Agents: Right. When you do give away the book, what setting are you in then? Mark: Well, I use it a couple of ways. I do use it for expires and FSBOs, but I've only recently started doing that, so I don't really have a handle on how effective that's going to be. Mark: But, primarily, I'm using it at open houses. Smart Agents: Okay. What other kinds of marketing do you do? Mark: Well, certainly social media. You know, I'm part of a very large team, so most of the marketing is really team-wide, rather than individual agents. So we do direct mail. We do events. We do everything we can throw at the wall that might stick. Smart Agents: Right. Do the other people in your team use the books, too, or is it just you? Smart Agents: Okay. Are there any particular strategies you found that you think help get you the ... Well, let's stick with the buyers, at this point, since that's pretty much mostly where you've used the books. What do you find works for you? Mark: I think it's like most things in life. It's all about establishing rapport and trying to build a relationship. In open houses, it's a function of really being on and up, and trying to listen as best as you can, particularly, if it's a busy open house sometimes it's hard to do, if you've got three couples swirling around you at the time. But, really, working hard to pick up on what their specific needs and wants are. I think the more you can share, in the way of information, the more appreciative they'll be and the more they'll perceive you as a person that's going to provide them with experience and expertise. Smart Agents: Yeah, that makes sense. Okay. As far as when you're trying to, then, close a deal. Do you work with sellers or are you really primarily working with buyers? Mark: Well, in the last year, I did about 20 transactions, and I'm just working off the top of my head, probably, about two-thirds of them were with buyers. Mark: And the sellers were a combination of investors, who were then selling their flips, and also listings that I generated on my own. Smart Agents: Okay. Let's see. Is there any ... This might be different, because you said the marketing is done team-wide, but have you guys found that there are any certain kinds of marketing, or events, or things like that, that have the best ROI? Whether the investment is time, or money, or both? Mark: You know, it's like I said, the market has evolved to a point where it's all about relationships. I, personally, have not found direct mail to be particularly effective, although, from what I read, it's actually becoming more effective than emails. Go figure. I'm finding emails are less and less effective because we're also besieged with 200 emails a day. Most people just go delete, delete, delete, delete. Mark: I don't have a magic bullet for you. Smart Agents: Yeah, that's okay. Mark: I think you try a little of this, a little of that. I do do some boosting on Facebook. It's difficult to quantify how effective that is because people don't come to an open house, or call you about a listing, and they may or may not launch, "I saw your ad on Facebook." Mark: I should probably ask that question. But, you know, it's like I said, you throw spaghetti at the wall and some things will work, and some things won't. Hopefully, on a cumulative basis, it's going to generate the revenue you've targeted for the year. Smart Agents: Yeah, makes sense. Go ahead. Mark: I was just going to say, I wish there was a magic answer to that question. But, unfortunately, there isn't. Smart Agents: Yeah. I'm sure you and all other agents and brokers out there. Smart Agents: What would you say to an agent who's really struggling, or maybe even a brand new agent, as far as just making their way in this career, in this field? Any advice. Mark: Well, I guess, what I would say is, if you can, and I can't say that I'm particularly good at this, or skilled at it, or even emotionally capable of doing it. But, if you're able to cold call, that's certainly the way to jump start your career. Keller Williams is certainly very big on that. Other than that, in this community, it's not like you can door knock. You can get arrested. Smart Agents: Yeah, that's not a good thing. Mark: Yeah, I think that's probably it for new agents, or struggling agents is, making cold calls is probably the most effective way to jump start it.